The chart shows the proportion of working age adults in four countries from 1960 to 2015. Units are given in percentages. The chart depicts the proportion of adults of working age in four countries, France, the United States, Japan and Germany, over a 90 year period. Taken as a whole, the working age population of all four countries peaked between 1990 and 2000, before showing a projected decline to 2050. Though Japan and Germany had the highest numbers of working-age adults in the 1990s, both are forecast to have the lowest by 2050, while the United States and France will have the highest. With regard to Japan and Germany, both had working age populations at over 65% in 1960. Whereas Germany’s initially dips slightly, their proportions of working adults peaked in unison at seventy percent by 1990, before showing a projected decline to 52% for Japan and 55% for Germany by 2050. Similarly, the percentage of adults under the age of retirement in the United States and France showed a gradual increase from around 60% for both in 1960 to reaching a peak of over 65% by 1980. Over the next 30 years, each displayed slight fluctuations before being predicted to decline steadily to 60% and 55% respectively by the period's end. Think of different synonyms for the graph subject: adults under retirement age, working adults, the working age population. Here we use “taken as a whole” instead of “overall”. 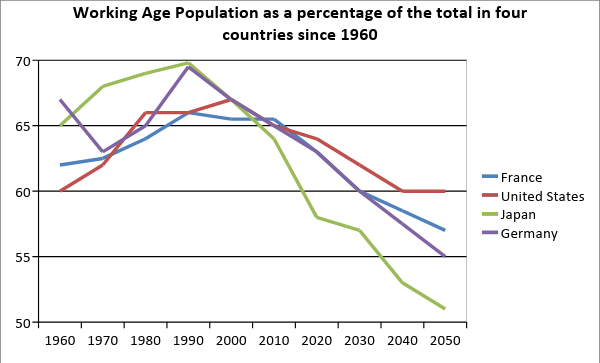 Of the four countries, all peaked and declined over the period, though Japan and Germany fared less well at the end. Describe the change of Japan and Germany over the period. It may also have been possible to state a trend at the start: Japan and Germany’s working populations fell at similar degrees after 1990. The first statement is a long complex sentence that shows the progression of data from one figure to a peak in 1980. The second sentence describes the downtrend of both, prefaced with an introductory paragraph to give the reader context. The order of information in the body paragraphs follows the sequence used in the overview. The chart depict the proportion of adult of working age in four country, France, the United States, Japan and Germany, over 90 year periods. Taken as a whole the working age population of all four countries peak between 1990 and 2000, before showing a projected decline to 2050. Though Japan and Germany had the highest numbers of working-age adults in 1990s both are forecast to had the lowest by 2050, while the United States and France will have the highest. With regard to Japan and Germany, both had working age populations at over 65% in 1960. Whereas Germany’s initially dip slight, there proportions of working adult peaked unison at seventy percent by 1990, before showing projected decline 52% for Japan and 55% for Germany by 2050. Similarly, the percentage of adults under the age of retirement in United States and France showing gradual increase from around 60% for both in 1960 to reaching peak of over 65% by 1980. Over the next 30 year, each displayed slightly fluctuation before being predicted to decline steadily to 60% and 55% respectively by the period's end. What is the overall trend of all four countries? Are there any similarities between the countries? Which show the highest peaks and lowest dips? Which ones can be grouped together to form two paragraphs?